When Peter Drummey looks up from his desk, he is reminded of the reasons he loves his job as librarian for the Massachusetts Historical Society. A few feet away is a heavy wooden desk that belonged to US Senator Charles Sumner of Massachusetts, a 19th-century abolitionist who was nearly caned to death on the Senate floor by a proslavery congressman from South Carolina. On the wall to his left is an 1843 painting of Brook Farm, a former utopian project in West Roxbury where Drummey has done archeological work. Nearby is a glass-encased model of Columbia, the Massachusetts merchant ship that opened Boston trade to China just after the Revolutionary War. And across his 21-by-12-foot oblong office is a stunning nautical chart of Nantucket, first drawn by the British Navy in 1781 and reprinted more than two centuries later from the original copper plates. “I really have the best job of anyone I know,” says Drummey, who has worked since 1978 at the nation’s first historical society. At his fingertips in its Boylston Street headquarters, free and open to the public, is a trove of American historical papers whose importance is unsurpassed outside the Library of Congress. Copies of the Declaration of Independence, handwritten by Thomas Jefferson and John Adams, are kept here. As is a personal account by Paul Revere of his midnight ride, a recollection composed specifically for the society. And what the society has done is collect, preserve, and communicate American history to the public since 1791. “Massachusetts” is part of its title, but the society’s interest is broad, deep, and national. Extensive personal papers of three presidents — John Adams, John Quincy Adams, and Thomas Jefferson — are at the core of an immense collection that spans the Colonial era to the 21st century. Drummey, 69, is the great-grandson of Irish immigrants, but the portraits, busts, photos, and works of three-name heavyweights such as Henry Cabot Lodge, John Singer Sargent, and James Ford Rhodes speak to him from perches in his office. Drummey’s duties include outreach, public programs, and exhibitions for the society, which is housed in a 119-year-old building listed in the National Register of Historic Places. When the society moved here from downtown on Tremont Street, its site bordering the Fenway was considered the hinterlands of Boston, a place so rustic that a painting shows a Barnum & Bailey circus sprawled across an open lot there. The Isabella Stewart Gardner Museum sits across the Fenway. Berklee College of Music is nearby. And the neighborhood is within earshot of sold-out crowds at Red Sox games. Inside the society’s four-story brick facade, the atmosphere is serene and quiet, a place for study and for awe. An 18th-century portrait of Boston merchant Peter Faneuil hangs beside an elegant, curving staircase. A few steps away is the copper weathervane of an arrow-wielding Native American that once adorned the mansion of the colony’s British governor. And just off Drummey’s office is a spectacular library donated in the mid-19th century by Thomas Dowse, a largely self-educated businessman from Cambridge. 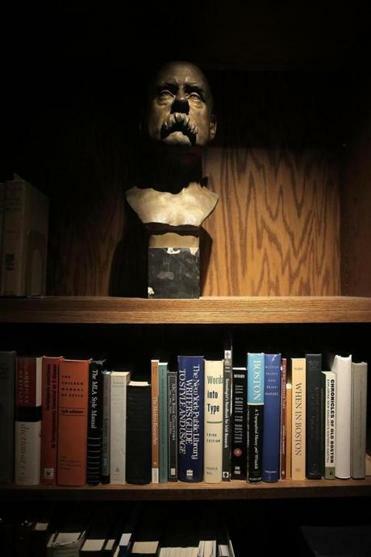 Drummey draws inspiration from vestiges of the past, including the bust of Charles Francis Adams II, a president of the society more than a century ago, whose dour gaze seems trained on the librarian’s shoulder. Drummey also finds something admirable in a simple drawing of a buffalo hunt by a Cheyenne warrior who had been relocated from the southern plains to a Florida military base in the 19th century. The illustration was among Cheyenne artworks given as a gift to historian Francis Parkman Jr. following a trip to Boston by Howling Wolf, one of the tribe held in Florida, for treatment at the eye and ear hospital. The sprawling collection is never considered finished and the job satisfaction apparently never ends, either. “There really isn’t anything like it,” Drummey says of his work. “It’s interaction with people. But at its heart, it’s the things themselves . . . The range of materials here is just extraordinary. Correction: A lawmaker from South Carolina who nearly caned to death US Senator Charles Sumner was a member of the House of Representatives, not the Senate. A previous version of this article misidentified him.